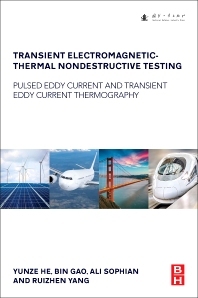 Transient Electromagnetic-Thermal Nondestructive Testing: Pulsed Eddy Current and Transient Eddy Current Thermography covers three key areas of theories, methods and applications, primarily the multi-physics field, including eddy current, heat conduction and Infrared radiation for defect evaluation, lateral heat conduction, which is analyzed to detect parallel cracks, and longitudinal heat conduction, which is analyzed to detect depth defect, or that which is beyond skin depth. In addition, the book explores methods, such as time domain, frequency domain and logarithm domain, also comparing A-scan , B-scan and C-scan. Sections on defect identification, classification and quantification are covered, as are advanced algorithms, principal components analysis (PCA), independent components analysis (ICA) and support vector machine (SVM). The book uses a lot of experimental studies on multi-layer aluminum structures, honeycomb structure, CFRP in the aerospace field, and steel and coating in the marine rail and transportation fields. Dr. He is a lecturer in National University of Defense Technology (NUDT), China. He is also IEEE member and ASNT member. He has published more than 30 papers on peer-reviewed journals and conferences, in which 8 papers have arrived into global 10% and 1 paper has been awarded as highly cited paper in Essential Science Indicators (ESI).